Although one might think Shamir is a wizard of lore, the message is likely referencing Adi Shamir , an Israeli cryptographer. “Shamir’s spell of recombination” might be a reference to the secret-sharing algorithm he invented. The algorithm allows a message to be divided into parts, and if a certain threshold is met—in this case, 400—then the secret can be solved with less than the total number of parts. 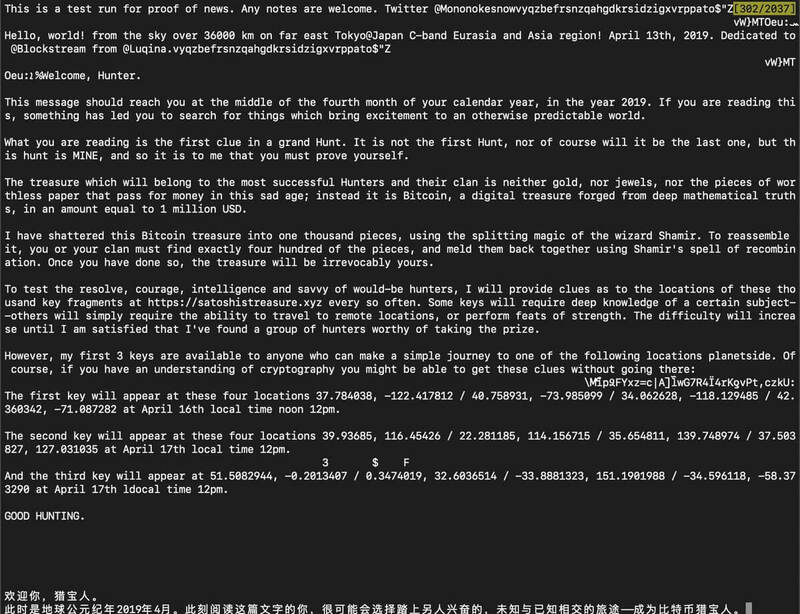 To add to that, these kinds of cryptographic treasure hunts are not uncommon in the Bitcoin-sphere. There is a community tradition of hiding private keys in things ranging from sculptures, to riddles, to paintings . However, this would be one of the largest BTC prizes publicized to date. Interested puzzle-solvers can read the full message here . The post Satoshi’s Treasure, the hunt is on for $1 million in bitcoin prize appeared first on CryptoSlate .